Waterford United Football team plays in the League of Ireland. 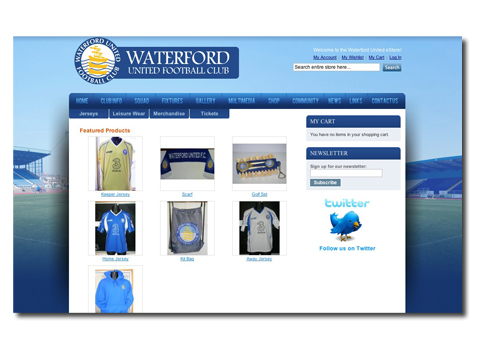 We were approached with the request that for a complete redesign of their club website and to set up an online shop for the sale of club merchandise. This design project creatively incorporates a large quantity of diverse information in a clear and concise way. 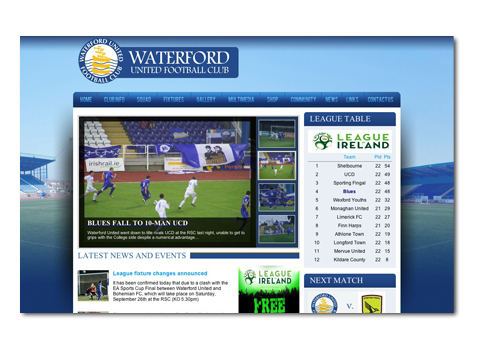 A clean and usable interface was designed with the club's blue and white colour scheme. This had more impact than the previous one, and it stamps a memorability factor on the website. Part of our brief was to setup an eCommerce solution which allowed their fans to browse through the different products with ease, and place their orders in a secure and user-friendly environment. To achieve this we used the Magento platform, a robust eCommerce software application designed with usability in mind for both the users and administrators. To allow for efficient updating of the website content we employed a customised version of WordPress, a powerful open-source Content Management System (CMS). We provided website design with valid CSS/XHTML and website hosting. "From our initial meeting, Kevin was extremely professional and knowledgeable. The design brief was complicated and involved many different elements to be pulled together. At every stage of the process Alpha Design was on the ball. They presented material on time and addressed issues promptly and effectively. Communications were always spot on while their professionalism instilled a sense of dependability throughout the process. Waterford United would have no hesitation in recommending Alpha Design and we look forward to working with the team going forward."